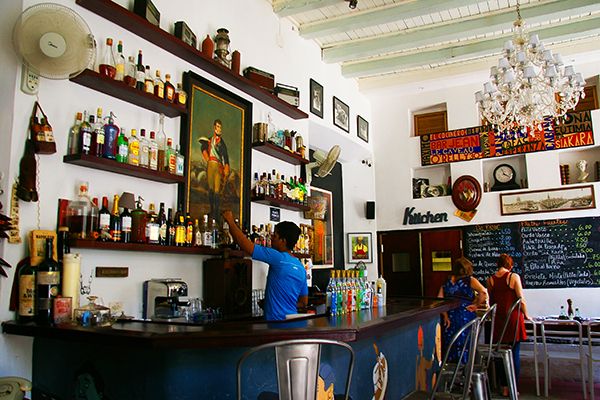 Located in Centro Habana just behind The Capitolio, this unassuming bar is a gem that has not yet made it onto many tourists’ radars. Most of the patrons here are chic Cuban hipsters in their 20s. It gives off a Bohemian vibe, with a lounge occupying about one-third of its space on the left. The drink menu is printed on the back of a license plate and gives you different selections of cocktails, rums, whiskies and beers. Prices are very approachable given the quality of drinks here. The daiquiris and gin and tonics are must-orders. All the cocktails cost only $2.5 CUC. There is only one wine on the menu though – offered in rosado, blanco y tinto. The service is bit slow on a busy night since there is just one bartender fixing drinks for everyone.